YouTube user crysknife007, no longer content to merely be the person who helped you drift off to sleep to the soothing sounds of Harrison Ford’s Blade Runner apartment or the Battlestar Galactica, has apparently decided to put his “bizarrely long loops of weird sounds” talents to use in a slightly more educational direction. 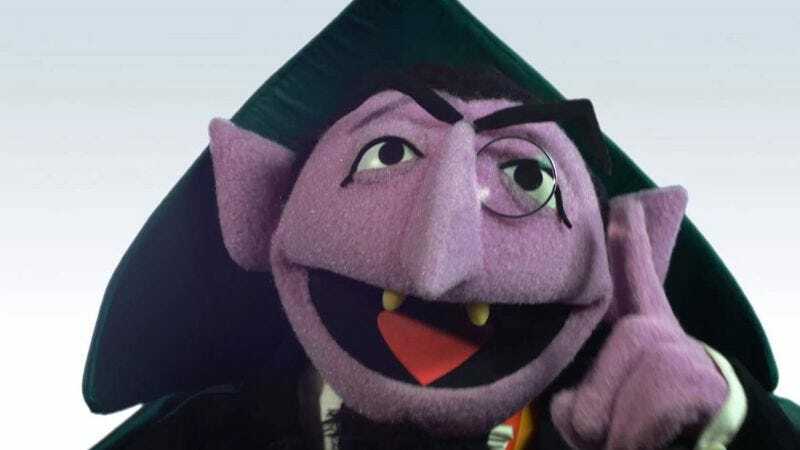 For instance, by putting together a five-and-a-half-hour-long video of The Count from Sesame Street reciting the first 10,000 digits of pi. Sure, there are also 100- and 1,000-digit-long versions you could listen to. But if you’re going to listen to digitally assembled audio clips of a puppet laughing mechanically between the digits of a number with no end, why skimp on the length? It’s not like listening to this for more than a few minutes at a time (perhaps while writing about it for a popular pop culture blog) could turn your brain to mush or leave you weirdly anxious to hear The Count get back to “nine,” because he pronounces that one in a funny voice. It’s perfectly safe, if less inherently soothing than some of crysknife007’s other videos. You definitely won’t end up running four or five versions of the video at once, listening hypnotically as the various laughs try and fail to sync up with each other, until you run down the hall with a machete, laughing “Ah ah ah” as you go. Of course, if you love pi but hate The Count—an unlikely proposition, since The Count is the patron vampire of math—you can listen to crysknife007’s four-hour video of pi being played on a rotary telephone, instead.